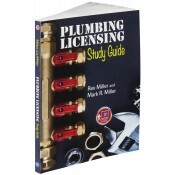 This book is designed for use as both a text and study guide for those students taking the licensing test in plumbing. Because of the large number of residential dwellings under construction and planned for the near future, this is a growing area. Well trained and knowledgeable plumbers are urgently needed in most of the individual United States and Canada. The field of plumbers, pipefitters, and steamfitters is predicted to grow about 12% each year until 2024, faster than most professions. The onslaught of new buildings is behind this surge. Here, in one book, the entire plumbing trade is covered in one accessible source. Consideration is given to cover all states' exam requirements. Tools and instruments are included to familiarize the licensing candidates with labor-saving devices and their correct utilization. While there are hundreds of practice exam questions, there is no guarantee that these questions and answers will appear on the actual test, or that the reader will pass the exam by simply reading this book. The main emphasis is on getting the tradesman accustomed to testing and knowledgeable about the plumbing trade in general. While there used to be several good resources for those studying to become licensed plumbers, these are quite old and rather outdated. This textbook/study guide will fill a void in this increasingly important trade. Includes valuable tips and illustrations of the various tools and equipment used in the trade. Practice questions with answers (at least 400 in the book, and several hundred more on an affiliated website) will be included at the end of each chapter, organized according to the various aspects of the trade. Some suggestions for taking tests and studying for exams are also discussed, along with tips for instructors who are preparing lesson plans and curricula for teaching plumbing certification. An affiliated website will have additional test questions, videos, and color photographs of the more eye-catching scenarios in the book. Ch 25: License Requirements and Applications.